Ever wondered what a restored Chesapeake Bay would look like? Head to Smallwood State Park along Mattawoman Creek, located about 22 miles south of Washington, D.C. This tidal freshwater estuary is an approximate representation of the Bay’s ideal conditions: exceptionally clear water, extensive beds of submerged underwater vegetation (SAV), and many species of fish, mussels, amphibians, reptiles, and birds. Unfortunately, this hotspot for biodiversity has faced increased pressure from development, threatening wildlife and water quality. 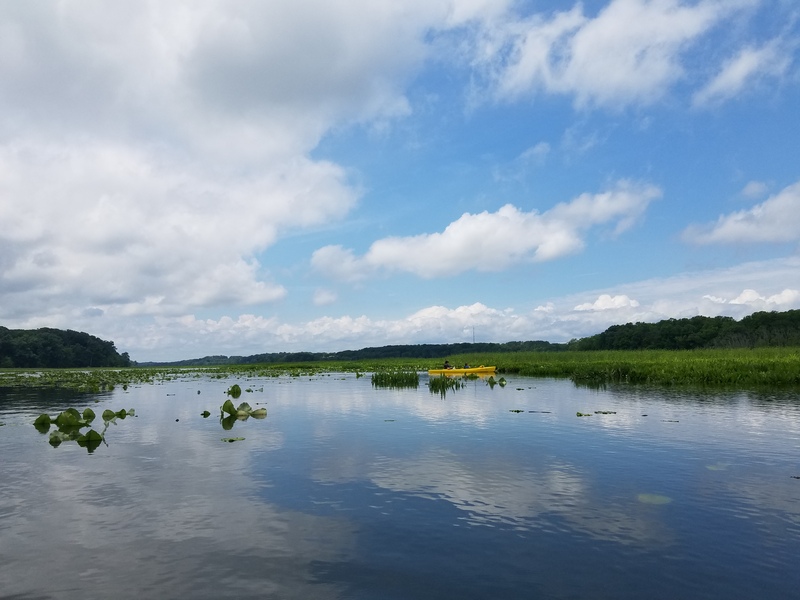 Mattawoman Creek appears on Captain John Smith’s 1608 map as “Mataughquamend,” an Algonquian compound meaning, “where one goes pleasantly.” Paddling here is certainly pleasant, although it can be difficult to navigate through the submerged grasses and American lotus. Cost: Atlantic Kayak Company ($16-65) single kayak $16/1-hour, $25/2-hours, $35/3-hours, $50/all day; tandem kayak $22/1-hour, $35/2-hours, $45/3-hours, $65/all day (add 6% MD Sales Tax to all rentals).